Thanks to Cathlin Shapiro who submitted this post for her great-great aunt Lillian Proietto. 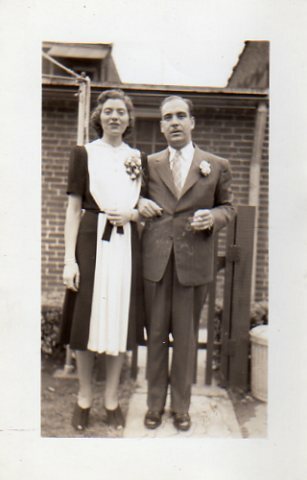 The photo is of Lillian with her nephew (Cathlin’s grandfather), Paul Romano. My great-great aunt, Lillian Proietto, was a trailblazer in the STEM field of Biology, and her research on the 17-year mating cycle of the cicada is still referenced today. Born in 1907 as a first-generation Italian-American to recent immigrants to the United States, she was rare for her generation in that she not only received a college degree, but also a Ph.D in Biology. She became the head of the Biology department at St. Mary’s College in Leavenworth Kansas, eventually teaching at Marymount College in Tarrytown NY, which later merged with Fordham University in 1945. Her Ph.D dissertation was titled “The Periodical Cicada – Internal Comparative Anatomy”, in which her research analyzed the interesting mating cycles of the North American genus of the cicada, which occur only every 17 years as a method to avoid predators. Her dissertation was published in 1936, and is categorized under “Biology and Entomology”. Her achievements in higher education and teaching have influenced my family for at least three generations now. She mentored my grandfather, her nephew, to attend college, get a degree in Biology, and teach during the depths of the Great Depression. This was quite an achievement also, as his father had no schooling at all! In turn, my grandfather held higher education as a standard for his three daughters, one of whom is my mother. My two aunts became computer programmers in the 1970s-80s, as computer science degrees were emerging, and they have recently retired after long, successful careers at large corporations. I hope that capturing Dr. Proietto’s achievements in this blog can educate and influence my own daughter (age 2), and my nieces (ages 7 and 13) and my nephew too (age 4) to create interesting and productive careers for themselves in STEM. Cathlin, That is so interesting. Unusual for a woman back then to even get an education! You have beauty and brains on your side! Caitlin, We also knew Aunt Lillian. We have many photos which I should share with you. You’re on a side of the family I didn’t know. My Mom went to college with her niece Nanette. My family spent summers with Aunt Lillian and her sister at Nanro in the Poconos. During the year we often visited each other. When Aunt Lillian retired and moved to LI, she gave me many of her books which I still have – I pursued a Biology Degree also. She was extraordinary.